Cheers! 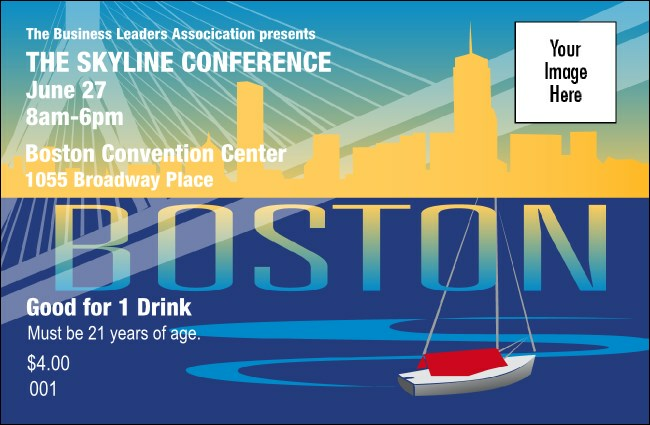 The Boston Drink Ticket and matching the Boston publicity materials, helps you keep the liquid refreshments flowing smoothly. Sell drinks in advance, reward your favorite benefactors, and take the pressure off your bartenders with individually numbered drink tickets, decorated with iconic images of the city that houses one of the most famous bars in the world. TicketPrinting.com features lots of local designs for every hometown occasion.